Gods living, loving, healing Spirit gives meaning to our lives. "All Gods Children," "My Heart is Overflowing," "Angels," "Architect of All Creation," "Heal Our Hearts," "Dream a World,"
"Let Your Light Shine," "Wind of the Spirit,"
Ideal for groups gathered for ritual and prayer. 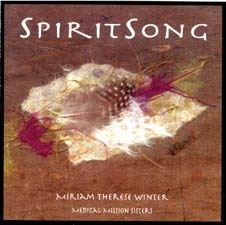 Many of the songs of SpiritSong are published in Songlines: Hymns, Songs, Rounds, and Refrains for Prayer and Praise. Those that are not will be available sometime in the summer of 2000. Well keep you posted.